Come and help at a Horse Ranch in Manitoba, Canada! 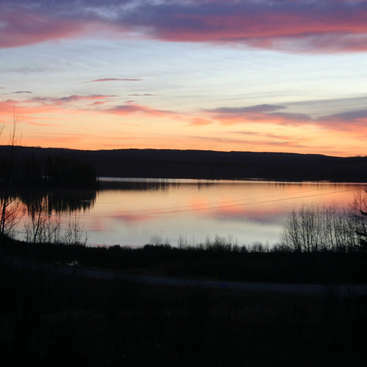 the Ranch has been a community service in the Clear lake area of Riding Mountain National Park for more than 30 years. A genuine love of horses and the outdoors by such a diversified wilderness area is the base for all our activities. 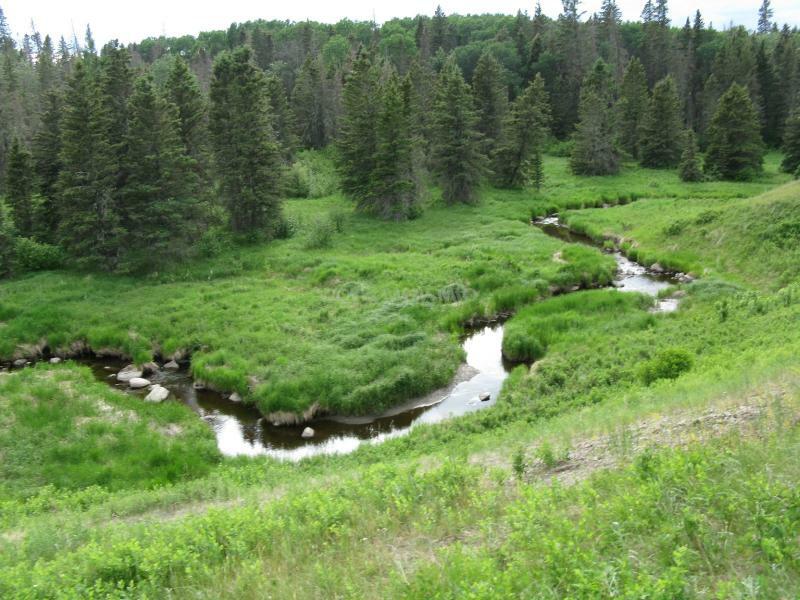 We maintain and explore true wilderness trails on the ranch and with guests into Riding Mountain National Park, Manitoba. 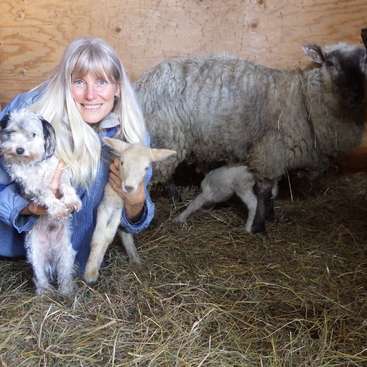 As a teacher, artist, horse trainer and licenced guide with Federal Parks Canada, I'm Anne, owner, and active ranch manager. I've been a dedicated horsemanship coach and outdoor guide for many years. 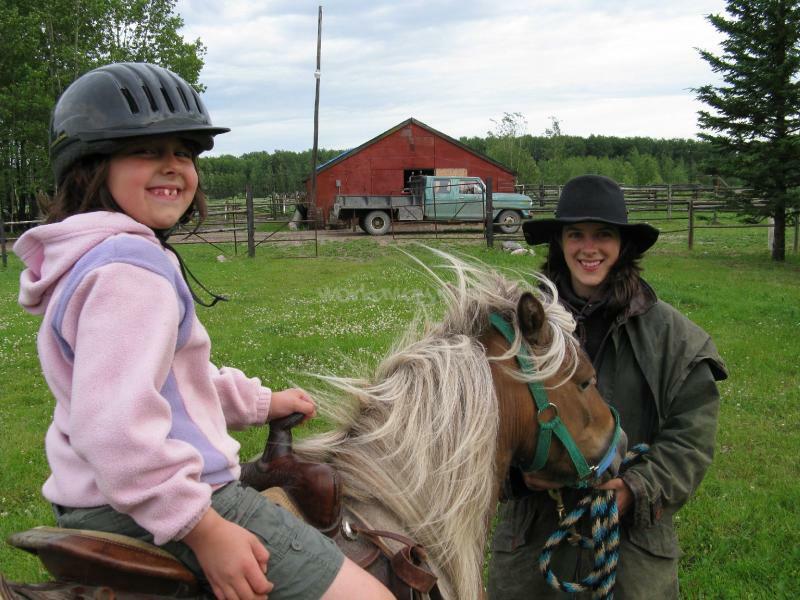 Our very short summer season in Manitoba has been a challenge to provide family oriented horse experiences that are provided at the ranch, and into the Park. Plenty of opportunities to share skills and learn new ones have been experiences enjoyed by many volunteers over the years. Anne has a professional teaching background, and is conversationally fluent in English, French, and German. Helping others with communication in English as a second language is easily done and useful on a daily basis. "Experiencing by doing" is one of our motos, and a total immersion in local festivals, concerts, rodeos and special events whenever possible is always a good idea and is encouraged. Regional cultural identity is different in every part of Canada. We live a very pioneering, self sufficient, repurposing and creative lifestyle typical of people who live in the Prairies and Parkland. People who love the challenges of life here, and responsibly pursue sustainabilty ethics are always welcome here. Raising, training, and working with horses is the spirit and soul of the Ranch, and our connection to the land. We are happy to share the experience with everyone who is genuinely willing to help our mutual efforts to live well. Being non-profit, we seek volunteers with a passion for experiencing new environments, and learning new skills in a team oriented ranch setting. Emphasis will be on learning with responsible behavior as a team. Flexibility and an open, non-judgemental mind is required to experience different values, lifestyles, building skills, new styles of horsemanship and surviving well outdoors in this region of Canada. If this sounds like you, and you are a true adventurer, we'd love to have you join our team this summer! of working on the land until projects are completed! "Ranch Spa", an outdoor washroom/shower house and sauna for ranch volunteers, if we find enough helpers that can contribute their skills for this unique project. We also have guitars, a piano, and other instruments for anyone with a singer song-writer talent. 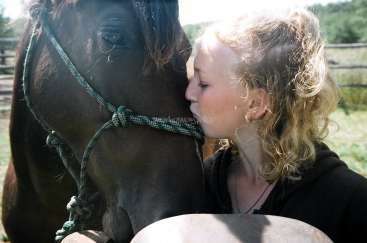 We like to share these activities at our youth horse camp for junior riders here every August. Accommodation is in one of several comfortable 12' X 12' tent cabins, with wooden floors, walls, canvas roof, windows and a lockable door, and electricity, or private bedrooms in a 6 bedroom detached unit.. Bunks and bedding are provided. and 3 piece bathroom facilities are in the main house. 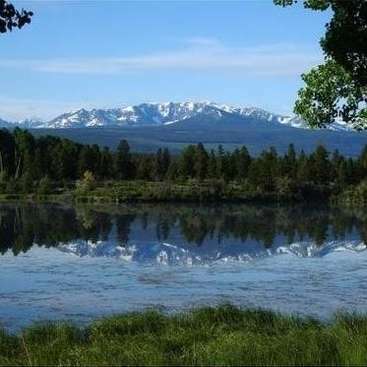 A pack list, map, general orientation to the ranch and the region is provided on the web site. Details, including a volunteer agreement will be provided in our communication. Volunteers are responsible to be properly equipped for all kinds of weather. We look forward to discussing and making individual interests, hopes and dreams for visitors, guests, and volunteers come true as we move into the new 2019 summer season here. 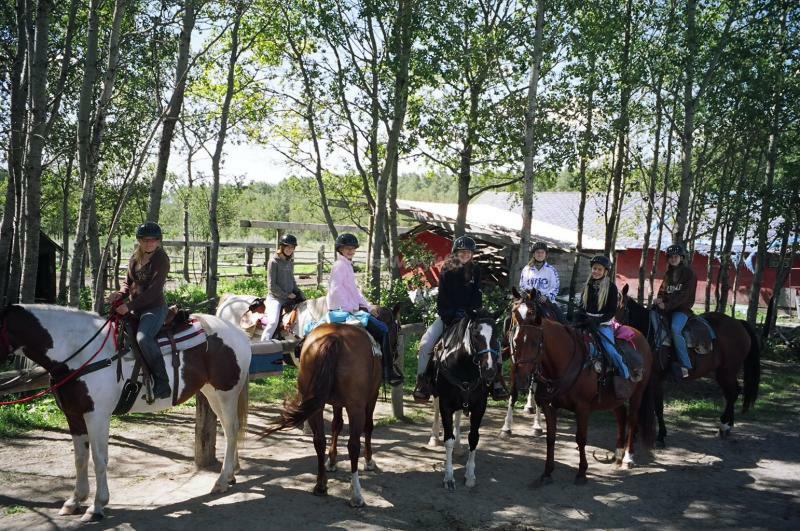 A line-up of riders for the Adventurer youth horse Camp held every summer at the Ranch, Manitoba, Canada. We love horses here at our ranch, and take every opportunity to live and work with them every day. From ponies to riding and wagon horses, the ranch is designed, built, and maintained for them, and the people that love to be with them. All our activities are community service and non-profit, so volunteering is a very important part of our spring and season. 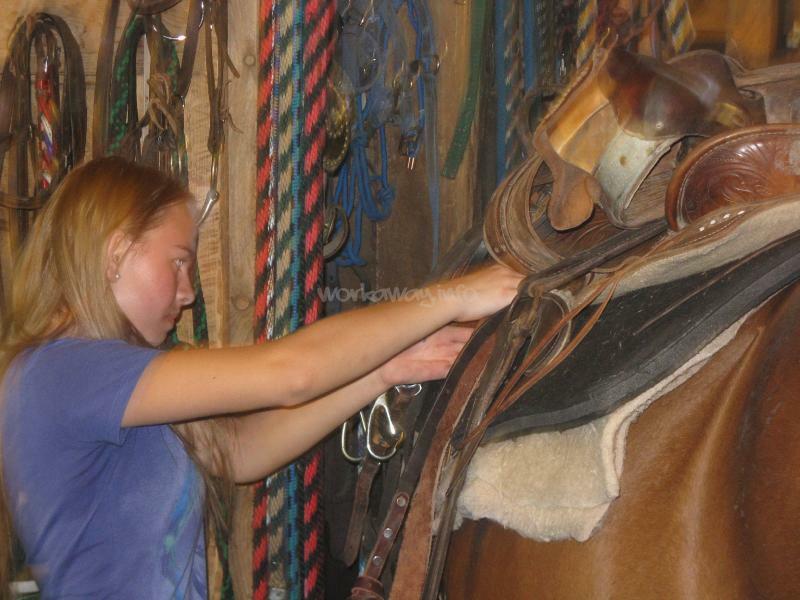 A volunteer's valuable help in catching, grooming, and saddling horses in the summer season. View from the Ranch House deck down the driveway facing east. View north on Strathclair trail off road into wilderness trails, Riding Mountain National Park, Manitoba, Canada. The marquis tent available on site for group functions. In the foreground guests enjoy the giant firepit. A momentary pause during training sessions on the ranch. Touch is important to gain a horse's trust. It’s been a while since we stayed at the ranch but we still want to leave a feedback. We have been at the ranch for only one week in 2017 when Anne took us in at short notice. We had such a great time that we decided to come back to Canada to stay last summer for six weeks. It never gets boring there. We built a very nice room in the trailer… read more where we slept, did some weeding but mainly we worked in the stables around the horses which are well trained and looked after. We fed, brushed and saddled them for the tourist trail rides in the National Park and very often we could join them. Anne taught us some horsemanship skills, how to gain the trust of her rescue ponies which were really scared of people last summer and how to work with young horses. We learned the western way of riding and sometimes we led little Jack for a pony ride which is really good to improve your english. It can get very busy in summer but Anne found time to take us to the Ride for life, a social ride and we had time enough to explore the surroundings for ourselves. Anne provided a car for her workaway people, so we could see the bisons and bears, drive to the lake for a swim or drive to Wasagaming for the world‘s best ice cream. We even got the chance to ride to Clear Lake which is truly beautiful!! Sometimes in the evening we sat at the campfire (especially during the youth camp which was a great experience) and enjoyed the stars and the quiet with William (the cutest cat in the world) or listened to Anne’s stories. She is a nice and funny person and always has a positive attitude. We really can recommend staying at the ranch if you love horses and like to be outside the entire day! I spent two weeks at Anne’s ranch last fall right before the winter starting kicking in. I spent most of my time with general maintenance projects involving carpentry and the like. I also accompanied Anne on a few rides and helped with the care of the horses. If you like to be around horses, this is quite an incredible experience. I think you… read more would be hard pressed to find one person managing a ranch with a score of horses by themselves, which means it really has a homey kind of feel to the environment rather than a business that’s interested only in turning a profit. It also means it can get quite a bit busy and hectic at times as she’s not only managing the stables, but also the volunteers and such; and it’s hard to predict the ebb and flow of the workday. But Anne is really a great cook and makes sure a good meal is served up. Lots of fresh vegetables which I didn’t even know I liked. And Anne is fun to hang around with, so you’ll have a good time and good chats, too. I went with the intention of working on some house projects as I didn’t have much experience with horses, but wanted to learn a bit more about them. I did a few other exchanges where there were two or three horses, but I tell you the experience of a stable full was pretty incredible; really no comparison. Mostly they hung out as a herd in a huge pasture in the back and they would come to the barn around feeding time or when they would need to be herded in for a ride. It was funny how they have their own personalities and temperaments as I learned how not to get thrown around by the ornery one. They’re like a bunch of big babies that just need the right amount of love and discipline I suppose, and you can learn from Anne how to be firm but gentle with them. Some just need a bit more correcting than others, but they seem to get it. The horses are very well cared for, some are rescues and a bit timid, and some are elderly and need extra attention; and the barn is well equipped for its purpose. I think I speak mainly for the guys that might be interested that there are always lots of projects that need tending to in this environment. I brought a lot of construction skills to help with, but even if you just have a good work ethic and a bit of muscle you certainly could make yourself useful. And I think I got saddled with just enough of the horse work that I could handle with my limited knowledge; but left with a greater appreciation of what it’s like managing a herd! If you go in with the intention that every little bit you do will go a long way in helping these amazing creatures, you will leave with quite a rewarding experience. I stayed for three weeks on Anne's Ranch and it was a wonderful time! We had a lot of fun and adventures together and Anne is a really nice, chatty and humorous person, so we often shared a laughter.I had to do a bit of weeding and yardwork, but most of the time I had to work with the horses and I was riding three or four times a week. The Ranch… read more is nearly the "Riding Mountain Nationalpark", in which we were riding often. I had the chance to see a lot of great animals like bears and bisons. All in all the three weeks were a great experience in which I had a lot of fun and nature to enjoy! Ryan was an awesome visitor/helper at the ranch. He was always cheerful and loads of fun to be around, in the short time he had planned to be here. he had an open mind and was willing to contribute his knowledge and experience freely whenever it was needed. He was willing to help with our various eclectic building and landscaping projects until… read more the projects were done, You are welcome to come visit us again anytime you find yourself in Canada Ryan. Every good wish for good luck and good times in your travels! I had a great time with anne on the ranch, it was fantastic to see this part of the country in the fall. I was very very well fed and looked after. I have spent three weeks at the ranch and it have been wonderful. I came there to practice my English and spend time with horses. I stayed in a cosy camper and ate healthy food with vegetables from her garden.Anne have teached me a lot about horse training and her nice horse "family". They were all well trained and I got to ride almost every day… read more on trails from one hour to six hours around the national park. I also had to work around the ranch for maintenance but it was nice to learn new skills. I got to see a little bit of the culture of the area since Anne took me to different events around the ranch. This is a great place for horse lovers and I highly recommend you staying there of you are one of those. Thank you again Anne for everything ! I stayed at the ranch for six weeks in total. It was a fantastic experience one i will never forget. Anne was a great host, always making sure I was okay. The food was very good with Anne buying a lot of healthy foods which was great! I had a period of time when i was on the ranch on my own which Anne had not foreseen, but she always gave me… read more plenty of jobs to do and made sure I had the numbers of her neighbors, where she was teaching and emergency services. I worked mainly with the horses, training and riding the, Anne taught me a lot about training young horses as I had little experience of doing so. They were all so nice and I had great fun with some of them! I also helped out with any maintenance work so I had opportunity to learn many new skills. As I was at the ranch during a not so busy time, Anne was able to take me to see many different places which was very interesting. So I learnt a lot about where I was! Thanks Anne for having me! You were a great host! Pascal and Nicolas spent just a few days at the ranch, and helped with fencing, carpentry and a few fix-it chores. We spend some time teaching them to groom and saddle horses, and went on a local ride. They had expressed interest in learning more about horses. Their help was very much appreciated, but they left early and unexpectedly, and did… read more not experience the National Park ride into a local beaver pond waterway, and a wilderness day ride we had planned for them to add to their horse adventure experiences. Both brothers were interesting and pleasant to be around and we wish them safe travels wherever they are enroute. I only stayed 2 weeks at the ranch, I wish it could've been longer. Before I was there I was on an other farm and met a french guy Quintin, we decided to look together for a new host, and Anne was so kind to take us in on lastmintue notice. I had to pick up the phone, cook and i also baked pies and cakes. Quintin had to help Lloyd, he is the… read more handyman of the ranch, he comes almost everyday from 8am until 5 pm. Quintin (and me too) helped him a lot with building a fence, cutting grass and fixing the roof of the barn. Quintin and i worked really hard on the roof, and it was sooo hot up there, but it was a great opportunity to do it because I don't think I'll ever do it again in my life. The second week i also had to take care of the horses because the two german girls who took care of them left early. Luckely I did horsebackriding when I was little so it wasn't that hard to do. Sometimes we had to work really hard because the riders came at 10am and Anne arrives at 9.55am, but then I could always ask Quintin to help me if there were to many horses to saddle up. The horses have all so different personalities but hey are all so lovely and beautiful, I already miss them. We slept outside in a little tent cabin, it's really fun to sleep there, sometimes it was a little bit cold (I almost always slept with 5 blankets) but you can hear and feel the wind, hear the animals, we even saw a bear one meter of our bed. Lloyd is such a great guy! He's so fun to work with, he's sooo funny and was always curieus what I backed and cooked. The only thing that was a little bit not fun was that sometimes the organisation wasn't that good, I had two times that there were rides at the ranch but i didn't know know they were coming. I enjoyed it a lot! Thanks Anne for letting Quintin and i stay at your ranch! You're ranch is so lovely, I really loved being in an open space and with so beautiful nature. Aurelia was a very commited and enthusiastic young horsewoman, who quickly took a personal interest in the horse she was learning to train. She contributed tremendous confidence, despite her small size, with careful hand-to-mouth connection with every horse she rode. She showed excellent natural rythm, balance and flexibility. equine-rider communication, and was willing to expand her newly acquired knowledge and skills in western riding into wilderness trails. Her positive attitude, straightforwardness, and sense of humour will be missed. Best of luck in your travels and continuing adventures with horses, Aurelia! We hope to hear from you again someday. I had a great experience at the ranch. Sometimes I had to work for more than 8 hours per day but it was worth it. Anne taught me a lot about horses in a way I couldn't have expected. I had the chance to learn how to train a horse, it was amazing. If you are a hard worker who really loves horses this is the place to go. I spent 5 weeks here in July and August. My main role was looking after the horses - tacking them up in the morning, going on the rides, unsaddling them and feeding and watering them. There are 15 horses on the ranch, with about 8 that can be rented out to clients. A part of the job that I enjoyed was riding the other horses (that weren't trained… read more enough for renting out) on rides (for usually around 4 to 6 hours a day). There are many different type of horses here, from a 1 year old colt to a 30 year old mare, with some perfect for beginners and others requiring experienced riders. I was at the ranch during peak season, which meant I got to ride a lot, but also that Anne was very busy taking clients on rides. This was a shame as it meant that she couldn't teach me many things such as how to work (using join up) with a horse she owns that was mistreated a few years ago. During 10 days of my stay, I was the only volunteer, which was difficult due to the amount of work. It meant that I got few days off, and sometimes had to work from 8 in the morning till 10 in the evening. However, Anne did find the time to take me to a rodeo and a social ride (with about 100 riders from the community). Going on rides with the clients is good experience as it requires constant attention to make sure all the riders are safe, especially with the larger groups. This can be a little stressful due to trail hazards such as wasp nests and bears, but it enabled me to learn important skills. We stayed just over 3 weeks at the Ranch in August, unfortunately due to it being peak season Anne was on rides everyday which meant it was really difficult to have time off. Sometimes we had to work 12 hour days. My (Ben) work evolved: weed wacking, installing railway ties, fence work, gate hanging, general DIY, yard work, organizing the tent… read more cabins, and working with the horses. Kathryn's responsibilities were: taking telephone bookings, preparing meals 3 times a day, cleaning the kitchen and bathroom, checking out of date food, cooking for a girls youth camp and a camp trip of 44 people, helping with the garden and yard work, and also working with the horses. While we were there, there was another workaway volunteer who was in charge of the horse work. She had been there two weeks before we arrived and because she was saddling up the horses (8 at a time) 7 days a week, she had injured both of her arms and hands which meant Kathryn and myself were expected to get the horses ready for the trail rides with our limited knowledge of western riding. Solene, the volunteer, showed us as best she could with her bad arms what to do and how to saddle up the horses. It was a shame Anne didn’t train us herself as she has excellent knowledge of her horses, some she has had for 25+ years. All the horses have completely different personalities and I (Ben) didn’t feel comfortable riding them (I have never been on a horse so am still a little nervous and apprehensive about it). Kathryn had ridden when she was a child and only managed to go out on two rides during the whole time we were there, which was disappointing for her as it was the main reason why we chose the placement. We couldn’t see much of the surrounding area as we only had two days off in three weeks and we didn't have our own vehicle. Anne did lend us her car so we could go check emails and do laundry ($1 a wash) in the nearest town at the Elk Horn Resort (we did also use the hot tub and swimming pool at the hotel one time on Kat's birthday, but you're not supposed to). I had asked Anne if I could borrow the car one evening but it needed the headlamps changed for night time driving, which I was able to do for her and future volunteers. Anne doesn't like leaving the phone unattended as her business relies on being able to answer the phone 24hours a day, so it was a shame that we couldn't go out with the other volunteer. The nearby national park is good and we saw a beaver building his dam and the heard of Bison. There is a quirky book/coffee shop with wifi 15mins drive from the ranch. Clear Lake is a lovely place if you do get time away from the ranch, lots to do and see or just relax on the beach. Anne is a bit of a hoarder (never throws stuff away) and shopaholic (loves a good bargain and generous when it comes to food shopping), which can be a bit of a shock if you're not used to being surround by lots of 'things'. She does like making trips to the dump and has lots of plans of using the bits and pieces she brings home to 'up-cycle' various objects/buildings around the property. We believe we worked long and hard for Anne as did the other volunteer because we knew she needed the help and was too busy with the rides. However, if we're completely honest, we all felt like we were taken advantage a of a little and unfortunately the gratitude could have been more vocal. If you have experience in riding then we would recommend this placement as you could ride on average 6+ hours a day but mostly on the same trail. There are 3-4 trails total, but the most popular one is 1hour 40mins (boundary trail ride). On our last night Anne was kind enough to give us gifts as a thank you and goodbye, which we really appreciated. We enjoyed spending time with the horses and only wished we could have had more of an opportunity to ride them (they were a bit overworked by the end of the season) and seen more of the area. Thank you for accepting us as volunteers and please give the horses a pat from us! 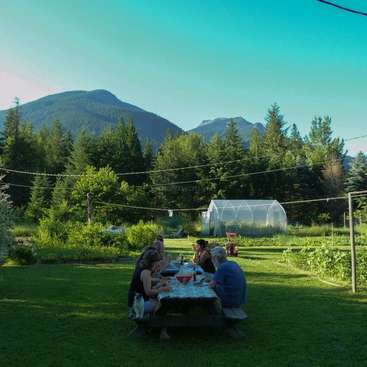 It was great to spend time in the middle of nowhere with Riding, cooking and helping in the Garden...! I loved this beautiful place near the great clear lake! Thank you Anne! Hope the raspberries are doing well! Our lodge is a small outfit with 3 guest rooms. we provide breakfast and dinner. 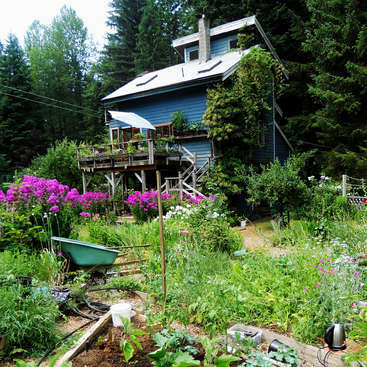 The lodge is situated on Charlotte Lake BC Canada.